I know I've told you all a million times how much Grace loves chicken, but just in case you forgot, or maybe you are new around here, I'll tell you again! Grace LOVES chicken! She eats it almost every night for dinner. While Joe and I also like chicken, we do enjoy a little more variety to our meals. This is not a store-bought rotisserie chicken. 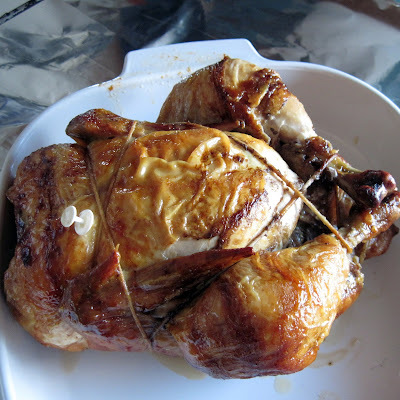 I made this one in our Ronco Rotisserie during the summer. Last winter, I prepared a whole chicken in the crock pot several times a month in order to have chicken on hand for Grace's meals. Over the summer, I got lazy. I still made a few whole chickens both in the crock pot and our Ronco Rotisserie, just not as often. So, I resorted to store-bought rotisserie chickens to make meal time a little easier. As with anything, the convenience of the pre-made chicken is more costly than if I did it myself at home. Sometimes, it's just worth it. And, just like when I make the chicken at home, I save the frame to make homemade stock. We even use the drippings at the bottom of the take-out container! Remmy enjoys that poured over her dry dogfood! Last week, I had 2 meaty chicken carcasses in the fridge. It was time to use them or freeze them. Since I was lacking room in my freezer, I figured I had better toss them into the crock pot with some water. I let them simmer on low overnight. The result was a very simple, homemade chicken stock. 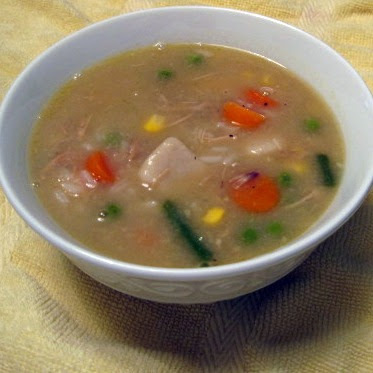 The next morning, I strained the stock into a large bowl and picked the meat from the bones. I set them aside while I tried to figure out what I was going to make with it. I was having a difficult time making a choice since there are so many options for leftover chicken: Chicken a la King (in the crock pot! 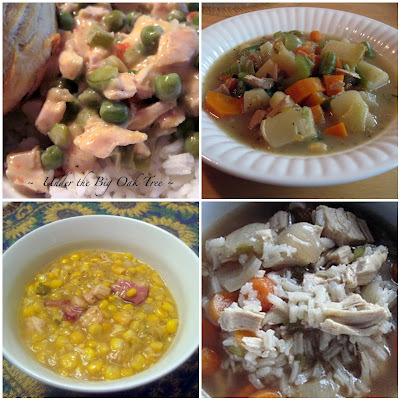 ), Chicken Stew, Chicken Rice Soup, Chicken Corn Chowder, casseroles. So many options!!! After talking to my friend Lisa, about what to make for dinner. I decided to make Chicken 'n' Dumplings for the first time. Although, it's one of Joe's favorite meals, I've never made it. All these years, the poor guy had to buy it in a can or order it at the diner! Lisa, emailed me one of her old favorite recipes for Chicken 'n' Dumplings. The one she used before she and her family started following a Gluten Free diet. (Check out her blog if you are in need of Gluten Free recipes for yourself or your family.) Lisa told me that this recipe was not only a family favorite, but one of the most frugal meals shes ever prepared. Since I already splurged on the cost of convenience, this frugal recipe was right up my alley! I poured all of the homemade broth into my dutch oven (my favorite for making soups, stews and chili...you can use a soup pot if you like), it was about 8-9 cups of broth. Lisa told me to add 4 chicken bouillon cubes and pepper (I used 1 tsp. pepper) to the broth, so I did. Then I allowed it to simmer on the stove while I mixed together the dumplings (ingredients to follow). Once the broth was at a full simmer (not boiling), I added the chicken that I removed from the chicken carcass earlier that day. When that was heated through, I started adding in my dumplings, allowing them to float on top. Cover and simmer for 20 minutes. See how this is such a frugal meal? This recipe calls for ingredients that most of us already have in our pantries! I forgot to take a photo of the Chicken 'n' Dumplings before we ate, but honestly, it's not a nice looking dish! I did, however, take a picture of the next meal that I made with the leftover Chicken 'n' Dumplings....Chicken 'n' Dumpling Vegetable Soup. I was inspired by this blurb to turn the leftover bowl of Chicken 'n' Dumplings into a soup. Pour leftovers into a soup pot, removing the dumplings. Dice dumplings into smaller, bite-sized pieces then add to the pot. Add remaining ingredients and heat to boiling. Joe bought a few bags of frozen rice when they were on sale at the grocery store. I had no idea how I would use them since one bag isn't really enough for us for a meal. But it seemed to costly to make more than one bag of this convenient, frozen rice. Well, one bag was the perfect size to throw into this soup! Leftover rice would work well, too. But we rarely have leftover rice. We really like rice! I'll be including both of these leftover chicken options to our menu plans this winter. I love the budget-friendly aspect of both of these meals. Aside from the rotisserie chickens and that carton of broth I added to the leftover Chicken 'n' Dumplings, I had of the ingredients in my pantry and freezer! Thank you, Lisa, for talking me into making this super-easy and super-cheap recipe! And thanks for asnwering my many, many questions I asked during the process of preparing my dinner! So much can be done with left over chicken, and your suggestion to try dumplings is fantastic. I agree with Hazel--you've shared some great ideas for using leftover chicken in creative, delicious ways! I'm going to click through for the chicken a la king in the crockpot. Come to think of it, I might have a carcass waiting to be turned into broth. I may stick it in the crockpot on low overnight with some veggies.